Sue Hayman, a member of parliament who acts as the Labour Party’s shadow environment secretary (the minority version of the official environment secretary), took to the House of Commons floor to push for the UK to declare an “an environment and climate emergency.” The UK has currently committed to reduce carbon emissions 80 percent by 2050, and emissions fell in 2017, according to data released last month. But declaring an emergency would likely involve charting a course to decarbonize completely by 2050 in an effort to limit global warming to 1.5 degrees Celsius. It’s unlikely the Conservative government will jump on board, reflecting a divide that’s similar to the fight that just went down over the Green New Deal in the U.S. Senate (but minus bizarre posters). But it does show the growing support for more aggressive climate policies around the world. More than 420 local governments have declared a climate emergency, according to data compiled by the Climate Mobilization, an advocacy group. And while this may be the first major political party to declare a climate emergency, other countries have acted like climate change is an emergency without making an official declaration. Small island states like Fiji, for example, have pushed for more ambitious action at international climate talks while Costa Rica has put forward an extremely aggressive plan to decarbonize by 2050. The UK Green Party’s sole representative introduced a motion to earlier this month that “calls on the Government to declare a climate emergency and to release the necessary funding, including to local authorities, to enact a green new deal that would rapidly decarbonise the entire UK economy.” The motion has attracted 43 supporters, including a number of Labour members. Now it appears Labour is ready to throw even more weight behind the idea. The pressure from the Labour Party at the national level itself comes from civil society asking leaders to approach climate change with more urgency. 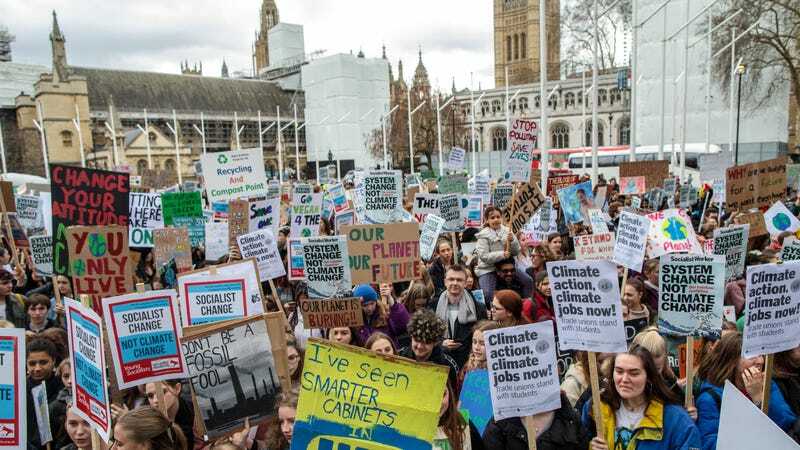 School strikers and adult activists alike have been turning the screws for climate action around the world for months, culminating in a major climate strike in March that saw roughly 1.5 million students take to the streets. “This is a really important step forward and a victory for climate activists and party members up and down the country,” Sam Knights, an activist with Extinction Rebellion, told Earther in an email. Whether the Labour Party’s declaration leads to setting ambitious targets or undertaking dramatic action, of course, remains to be seen. But it’s unlikely the pressure will let up as the urgency of climate change grows.